There are many reasons to want to fly without safety lines, and this may well be a step that you choose to take as you progress within flying trapeze. However, it's always recommended to learn new tricks first using the safety lines and to only take them off once you feel comfortable to do so (and you have the permission of your instructor). 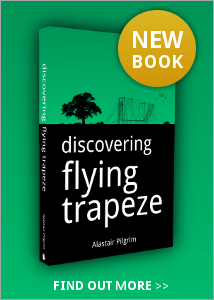 This topic is covered in a lot more detail in my book, Discovering Flying Trapeze. On this website, and in my books, you will notice that some complex tricks have been marked as 'No Lines'. This means that the trick is so complicated that it isn't possible to find an arrangement of the safety lines that avoids them tangling or wrapping around your body during the trick. Therefore the only option to achieve the trick is to try them without lines. Be extremely careful when attempting such tricks and discuss it with your instructor to see if there are ways to break it down to keep you safe while you practice.